Attic24: Attic24 Crochet Banner :: Ta-dah! Attic24 Crochet Banner :: Ta-dah! Back in March I had an idea to crochet myself an Attic24 banner, partly for useful reasons (to hang up at Yarndale when I'm there in the knit n natter lounge), and partly to feed my creative urges (what's not to love about a pile of colourful squares?) At the time I started out with this project I could already see the finished thing very clearly inside my Creative Mind, so I was really excited to see if I could bring my idea to life. I set out crocheting up a whole pile of 3-round solid granny squares using up oddments of scrap yarn left over from other projects. It only takes around 6g of yarn (I'm using Stylecraft Special DK) to make one square so it's a really fantastic stash buster if you fancy making a cushion, or maybe even a whole blanket. As well as making squares in every single colour possible, I also made a collection of blue squares. I concentrated on the deeper, darker shades of blue as I needed them to act as a strong background for my white lettering. The banner was still very abstract at this stage, and I had to keep focused on the bigger picture as I sat and made square after square after square. By the end of April I had enough squares to begin stitching them together, turning all those little individual bits of crochet into something beautiful and colourful. I really, really loved seeing the banner begin to take shape, it made me happy to witness the essence of my creative idea gently become a reality. Lots of people have asked me about my colour choices for this banner, and how I went about putting them all together. I can tell you that I put the border squares together very randomly indeed and gave very little thought as to what colours were going next to each other, or how it was all balancing out. As I was using up odd scraps of yarn, it really was a delightfully spontaneous process - I don't even know how many different colours are in this banner, but I do know that I love the outcome of all that randomness! Around the middle of May I'd finished stitching all the squares together, but needed a little breather while I pondered on what sort of border to create. It's often a very good idea to take a step back from a project if you are pondering on a design decision, so I did just that. A couple of weeks later when I was ready to pick this project up again, I knew straight away what I wanted to do for the border. I decided to keep it simple and graphic, alternating shades of blue (rows of treble crochet) with shades of pink/purple (thinner rows of double crochet) to create a subtle striped effect. I know not everyone likes crocheting borders (the rows are pretty lengthy and time consuming) but I adore them. I love the gentle rhythm that unfolds as you work those long, even rows of little stitches, and I love the bubbling-up excitement as the Ta-dah moment slowly comes into view. It's quite addictive, and I know I will never be one of those people who has loads of WiPs on the go, as I get such a kick out of finishing things! I thought at first that I would make the border quite wide, but when it came down to it the squares didn't need all that much holding together. The banner is quite long and thin, (or wide and short if you like) so I tried to keep the border in proportion. I think Tilly agrees with me, she is showing me her Approval Eyes here I'm sure. This is a very SHoUtY creation so the border was always going to be overshadowed by the squares, and that's exactly as it should be. Now at this point, there is nothing Banner-ish about this bit of crochet. In fact, it's all looking and feeling rather blankety wouldn't you say? Ah, there we go - Attic24 has landed!! I made the crochet lettering quite early on and you can read more about how I did it in my previous Banner blog post. The letters were made following a Times New Roman font, and measure around 20 cm tall. I used an iron-on adhesive web with the idea that I could gently iron the letters to bond them to the crochet background so that they would stay put while I stitched. However, this plan simply didn't work out. Not. At. All. Obviously you need to be super-careful with irons and acrylic yarn and you absolutely cannot blast the crochet with heat or pressure without doing irrevocable damage to the crochet. So I couldn't get the letters to stick at all as I wasn't able to apply enough heat or pressure to melt the bonding adhesive. ....with a good ol' bit of big-stitch basting. Success! One thing the Bondaweb did do well was make the letters beautifully flat and perfectly shaped, so it wasn't all a complete waste of time and money. I used white yarn and worked a neat row of back stitch around the outer edge of each letter. It was tedious in the extreme and took aaaaages to do. Stitching on the letters was my least favourite part of the whole thing and I can't say that I enjoyed it all that much, but I was so so happy that my name isn't something ridiculously long and wordy! The finished effect is lovely though, and I'm really pleased with the neatness of the lettering and the effective white-against-blue colour choice. And this is the finished thing, in all it's colourful glory - ta-dah!!!!!!!!!!!!!!! It measures 62 cm x 138 cm and has 144 squares. Lots of colours (sorry no exact colour info) and I think it's pretty scrumptious to look at. However, as lovely as this all is, it's STILL not a banner!!!! Ha!!! I realised very late in the day (when it was all supposedly finished and I was photographing the above Ta-dah) that I needed to come up with a nifty way of hanging the whole thing. Banners need to be displayed, obviously, and they therefore require a satisfactory hanging method. My solution was to add on some extra rows to the top long edge of the border which I then folded over and stitched to create a channel. Then sent J off to the DIY store to purchase me a length of pine stick, cut it to length and pushed it into place. Beautifully modeled by my happy little sidekick, who accompanied me to the park at 9am on Sunday morning so that I could prance about taking photos of my banner in the wild. He didn't complain once, but then his time and holding-up services didn't come for free. Oh no, I had to pay up. This cost me a cold drink and a piece of flapjack from the cafe, followed by a long stint at the pump track so that he could practice on his new bicycle. But it was worth it - I was able to sit on the grass in the morning sunshine crocheting up some ripples whilst he rode his bike round and round, so I wasn't too put out by paying up the required fee. And you get to see my banner in a suitably vertical position, with sweet Little Boy knees on display too. So that's the banner all done and dusted, folded up for a while now until it gets to come out to play for real at Yarndale in September. I'm really looking forward to seeing it in situ bringing some much needed colourful cheer to the grey concrete of the rustic auction mart. It's a cheerful thing, this banner of mine. No doubt about it. Ive just heard about your lovely work from a friend and I really want to subscribe but the click button isnt working - it just shows a page of text. Is it because I'm in Australia? Hoping you can get me subscribed.Thanks. Lovely banner! The letters look just as though they were printed on. And how they pop against the crocheted background! Looking forward to seeing this in action at Yarndale. Love the knees. reminded me of my boys gaining special snack for coming to fruit market with me on Saturdays and lugging home the bags. There were 7 of us! Love the banner too. stands out beautifully. A lot of worthwhile work! This turned out so pretty and colorful! Oh little boy knees! I used to think I wanted girl babies, but I was blessed with two boys. Now I know there is nothing quite like their squidgy little knees poking out of some dungaree shorts! One of my favourite things of yours. A batten at the bottom too would add the perfect finishing touch. Lucy it's stunning and very "you!" If ever I make it up to Yarndale you will be very easy to spot! I hesitate to say this as your work is so superior to my own...but can I suggest another pine rod at the bottom, it will make it hang so much more evenly...minor things like that don't usually stand out to me but I think it will really enhance your beautiful work. Thanks for all you do to brighten my day! Des coloris merveilleux, c'est formidable. Félicitations pour votre création et pour tout ce que vous faites. Bises. I love it! The border almost looks like a neon light! You are so creative. Wow, that's so stunning! You have such a good eye for colour, your random selection works beautifully. I would have used blue for the border and then I would have missed out on a spectacular border of electrifying glory surrounding this wonderful piece. The white letters look 3D on the background and I just know it will be an attraction for you this fall at Yarndale. Congrats on a finish to your banner. Beautifully done, Lucy! 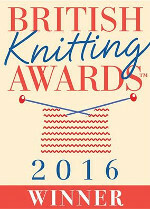 I voted for you (best blog) in the recent British yarny awards. Have fun at Yarndale! Congratulations on another fantabulous idea from concept to product! My life's dream is to go to Yarndale one day with my daughter (I'm in Canada, she's in Australia, so it isn't likely to happen soon). You are such an inspiration to so many - thank you for sharing!